By default the document of RadSpreadsheet presents to the user 1048576 rows and 16384 columns. However, it is not always necessary to present the user with the entire worksheet. In certain cases, you may want to restrict the visible area of the document in order to limit the user interaction to a certain range. 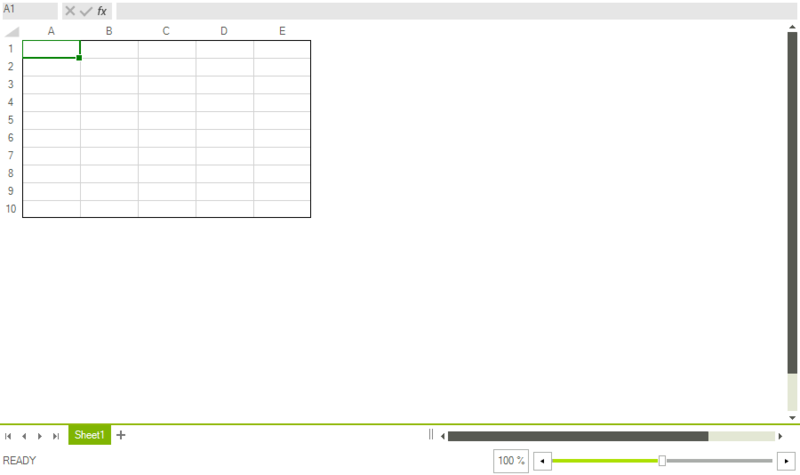 For such scenarios RadSpreadsheet offers an easy way to reduce the number of visible rows and columns. Even though the user is unable to reach the cells that are not visible, you as a developer can assign a value to every cell in the worksheet. Also, you may allow the user to open a file that holds data that exceeds the visible size. RadSpreadsheet does not have a mechanism to notify you that there is data outside the visible range. In such cases it is your responsibility to check whether the VisibleSize is less than the UsedCellRange of the worksheet and correct the number of visible rows and columns. Since the property restricts the rows and columns that the RadWorksheetEditor presents to the user, all worksheets will be displayed to fit in the restricted size. RadSpreadsheet cannot assign a different size to each individual worksheet out of the box.